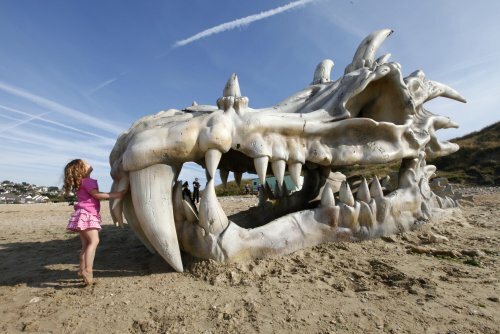 LONDON, 15 July 2013: Fossil hunters on a Dorset beach were stunned this morning as they stumbled across what appeared to be the remains of a giant dragon. The spectacular skull the size of a London bus appeared to have been washed up on Charmouth beach on Dorset’s Jurassic coast, famous for its treasure trove of dinosaur fossils. With a vast spine disappearing into the sand, fossil hunters, holiday makers and local dog walkers were stopped in their tracks on discovering the sensational creation. 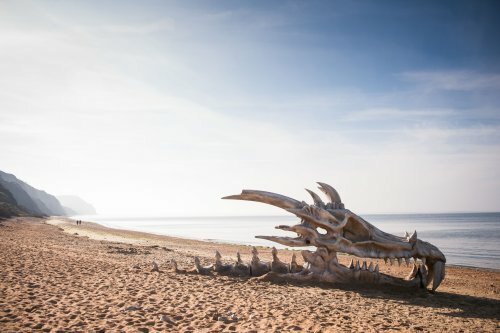 But as paleontology enthusiasts held their breath, the skull was revealed to be an impressive sculpture installed overnight by movie and TV streaming service blinkbox to celebrate the arrival today (15 July) of the third installment of HBO’s epic Game of Thrones on the service. A team of three sculptors took over two months to design, construct and paint the skull, which measures 40ft long by 8ft wide and stands at over 9ft tall. The dramatic work was inspired by a memorable scene in the series which sees character Arya Stark (Maisie Williams) discover a dragon skull in the dungeons of King’s Landing, the capital of the Seven Kingdoms. At this point in George RR Martin’s fantasy, the dragons are supposedly long dead, but it hints strongly at their return, which is a developing theme in the story. Game of Thrones season 3 ia available on blinkbox now priced at £17.99 (SD) and £23.99 (HD). It is not available on rival streaming services Lovefilm Instant, Netflix or iTunes.